THE NERVE OF THAT DENTEST! 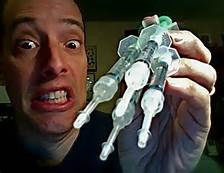 Several years ago, in a galaxy far away (ops wrong story) when I had just graduate high school, I went to see a dentist about my lower teeth buckling. According to the dentist, my teeth were too big for my jaw. This is a common problem and can be fixed with braces, most of the time. But unfortunately, I came from two parents that both had the same problem. So my teeth were a lot bigger than my jaw, and the dentist determined that it would be best to remove two of the back molars, “In order to make more room.” As I had already had my wisdom teeth removed years earlier, which I might add is another gross story, the farthest back two molars, were selected for removal. He started out by cracking the teeth and pulling out smaller fragments. This he told me was to minimize the stress to my jaw bone, he was worried that he may crack or chip the jaw bone. “Ham hride abht ha noh oo” I responded and again he surprised me when he understood my “I’m worried about that now, too.” He assured me that it would all come out okay and I shouldn’t worry. The first tooth went fairly well and was out in no time at all. He then started on the second tooth. About half way through, he became very delighted. He commented “Well, that doesn’t happen very often.” as he smiled down into my open mouth. He pulled back and looked me in the eyes and said “Do you want to see something awesome?” “hahom, Her” I responded (Awesome, sure). He leaned the chair up a little so that I could look down at his hand. There on the tip of a finger was a small white “thing”. It looked very much like the pictures of a sperm. It was white and had a round ball end and a long squiggly tail. Of course the first thing I thought was, how did he get that out of my mouth. “HWT HIS HIT?” (What is it?) I asked in complete confusion. I flipped out. I lost it. With all the worrying, and the fact that this was costing me a lot of money, just piled up on me. Now I have this guy rolling my nerve around on the top of his finger. I proceeded to yell at him, That I didn’t want to see that crap. How dare he show me gross stuff when I stomach was already messed up over everything that was going on. I wasn’t paying him to pay around with my nerves and he needed to get back to work. The look on his face was total incomprehension. Evidently he lost his ability to understand me as soon as I became upset. After a few moments of him just staring at me in wonder, I laid back and pointed at my mouth. The rest of the surgery was in blissful silence.